Explanation: What’s that rising over the hill? A galaxy. 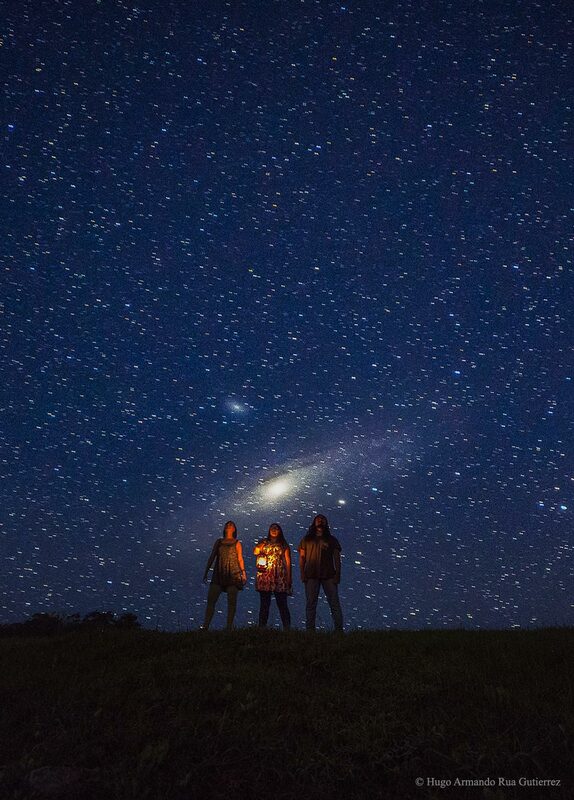 Never having seen a galaxy themselves, three friends of an industrious astrophotographer experienced an exhilarating night sky firsthand that featured not only the band of our Milky Way galaxy but also Milky Way's neighbour -- the Andromeda galaxy. Capturing the scene required careful pre-shot planning including finding a good site, waiting for good weather, balancing relative angular sizes with a zoom lens, managing ground lighting, and minimizing atmospheric light absorption. The calculated shot therefore placed the friends on a hill about 250 metres away and about 50 metres up. The featured single-exposure image was taken last July 26 at about 11:30 pm in Guatape, Colombia, about two hours from Medellin. The surrounding stars visible are all nearby in our own galaxy, while the small galaxy just above M31 is Andromeda's satellite M110.